Tungsten & Molybdenum are widely used to produce the crucibles and other parts for crystal growth and rare-earth melting with its high temperature resistance , low pollution and other good characteristics . We can select the best material for our customer's request, and supply maximum quality products with minimum deliverydate and cost. 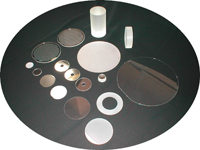 Lapping ・Polishing products : Susceptor , Ring and Lens , etc . 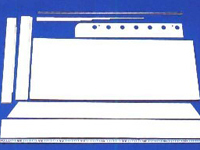 Welding products : Bath , Boat , etc . Lathe products : Reaction tube , Big size chamber , etc . By the continuous production from baking to molding of Alumina (Al2O3) , Zirconia (ZrO2) , AlN , SiC and BN , etc. , we can make possible to supply those continuously with stable quality. 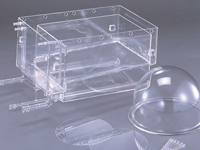 We can supply all kinds of Single Crystal materials and the precision processing one. 酸化物単結晶　Single Crystal Oxide : SrTiO3　LaAlO3　MgO　TiO2　Al2O3　SiO2　LiNbO3(LN)　SLN LiTaO3(LT)　, etc . フッ化物単結晶　Single Crystal Fluoride : MgF2　CaF2　BaF2　LiF　, etc . Copyright© . Sinyo CO., LTD. All Rights Reserved.